We have all these images and pictures in our heads when we think of heaven. Mostly maybe borrowed from greeting cards or television. But really, what is heaven like? Too often we can get distracted by that question, forgetting that God placed us here on earth for a reason: to live, to serve, to enjoy and cultivate creation. We are warned not to place our hope in heaven-of-the-future, but in God-of-the-NOW. We get lured into doing good and living a Christian life so will get a reward of comfort and luxury, an end to work and pain. But perhaps we are missing the true joys of heaven, joys that are with us even in this life. We get so distracted, working for our reward, earning our pay, winning the future of peace we long for… that we forget the God-given treasures all around. Heaven on earth. Friends. Family. Love. These are what heaven is made of, not an eternity of angel wings sitting on clouds playing harps without a care. 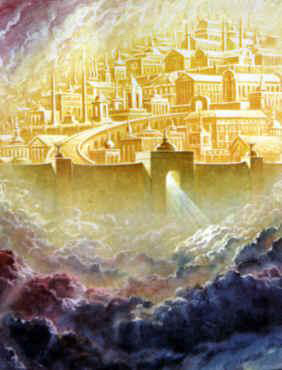 The Kingdom of God is here. While we are waiting for heaven-to-come, don’t miss the heaven that is here and now. Wherever love is found, there is heaven.